The boy and I had a movie-going trade off: we would each sit through a movie of the other's choice. I chose 500 Days of Summer. One was a low budget South African sci-fi film, exploring the morality of apartheid through alien body-horror. The other was a sweet'n'kooky indie rom-com, pondering the meaning of love. 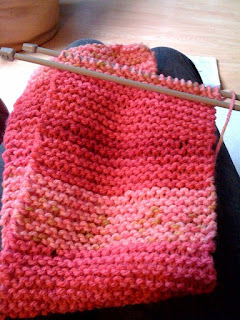 Last weekend, inspired by the ever-increasing bevy of knitting mammas among my friends - see Helen's lovely 'Hand-me-down Handicraft' piece on A Matriarchal Cornucopia - and fired up by my failure to take to crochet, I decided to learn to knit. Perhaps rashly, and not a little swayed by the helpfulness of the lady at Teasels Yarncrafts, I invested in some 7mm needles and a chunky yarn (ideally for hiding beginner's mistakes, apparently!) and set to work. I'm doing ok - I tackled casting on and knit stitch via the wonderful videojug How To tutorials and, so far, my scarf is growing nicely. I am thoroughly enjoying myself - the rhythm and low-level concentration required is very relaxing. Grain is a cool independent brewery running out of an old dairy in Alburgh in the lovely rolling (for Norfolk) Waveney Valley. It was started by Phil and Geoff in 2006, driven, they say, "by a love of great beers, a distaste for big business, a desire for a fresh start and an unhealthy dose of insanity." Phil works with me occasionally, as an IT consultant, and - having failed to check the Grain wares when they did the Ally Pally farmers market two weeks ago due to a fairly nasty bout of swine flu - this weekend, the boy and I ventured north-east up the A12 to see what it is all about. Yesterday, the brewery was hosting a Hop Harvest Festival Party, to celebrate the harvest and showcase their seasonal Fresh Hop Beer. Great fun: a mini real ale festival complete with bunting, morris men (the Golden Star Morris Dancers), a blues band, a barbecue of local lamb burgers, and a host of prize winning beers. The boy (being the designated drinker) sampled a selection, and we both really enjoyed the Oak brew, a mellow 3.8% pale ale. Phil also gave us a tour of the brewhouse: most interesting, with wood-panelled conditioning tanks and what I think was a giant copper kettle of some sort. Very impressive and highly recommended: if you're in the area, do pop in! I am baking this morning - one of my favourite activities, with eating the fruits of my labours coming close second - as I have real yen for soft, fluffy oatmeal cookies. The recipe is an inherited one, of course: taken from a battered paperback cookbook of my mother's, 'Betty Crocker's Best Cookies', or some such. Garish photography and liberal use of synthetic food dye in the 'serving suggestion' sample goodies indicate it was likely an American title imported into Jamaica in the mid-seventies. The loveliest thing is that the recipies are a whirlwind historical tour of twentieth century Western civilisation. 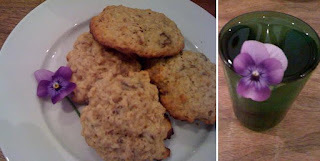 The oatmeal cookie recipe is called "Best cookie of 1935-1940". This was a childhood staple and the recipe book is heavily annotated by Mum - substituting wholewheat flour for white, brown sugar for white, etc., so probably during the brown rice - carob syrup - soya milk years!